Why are our tomatoes lucky you may want to know? First off, we buy local tomatoes while they are in season, but that season is not that long here in upstate NY. The rest of the year we buy “Lucky” Tomatoes, from Lucky Lee. 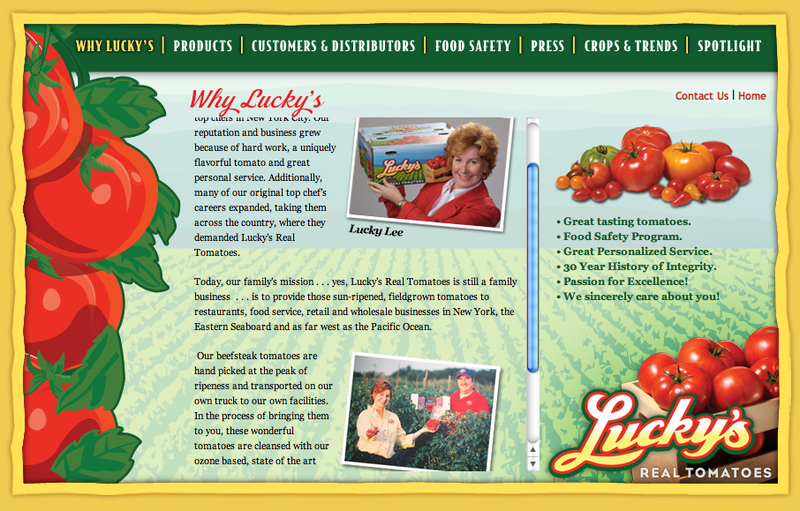 Lucky and her family have been in the tomato business since 1978. Here is what separates them from the rest of the tomatoes in the basket. • Lucky’s Tomatoes are grown on the farm they own. • Most, and I mean most, other brands buy tomatoes from anywhere and pack them under their label. These brands don’t own the land, they don’t know the farmer, they have never been to the farm. These brands source tomatoes from what ever country they can get the best price at the time. • Lucky’s Tomatoes are soil grown. • Other brands might be soil grown, but most of the time you are getting a hydroponic/greenhouse grown tomato. These are grown in greenhouses in colder climates where the tomato never gets enough sun to develop its natural flavor or nutritional value. Even a good amount of organic tomatoes are NOT soil grown. • Lucky’s Tomatoes are shipped on their own trucks. Yes they are control freaks! • Other brands rely on whoever can ship their tomatoes on airfreight or trucks the cheapest. Those beautiful looking vine on tomatoes in the grocery store usually get air-freighted in from Holland and are greenhouse/ hydroponic grown. Who knows what was on the truck before the tomatoes got there? • Lucky’s Tomatoes are grown by her brother and his team on the farm. • Other brands of tomatoes are grown by who knows who or where. • Lucky’s Tomatoes food safety program is run by her brother Marc. • Other brands follow safety programs too, but nothing like a family run business. • Lucky’s Tomatoes are sanitized with ozone. • Most other brands are sanitized with chlorine, ammonia and/or other chemicals. • Lucky’s Tomatoes are not coated with wax. • Most other brands as soon as you pick them up are slippery from the wax. The so-called safe to eat wax. • Lucky’s Tomatoes taste awesome all year. Real soil and sun make a huge difference. • Well you know the cardboard flavor that so many people refer to when they eat a tomato. 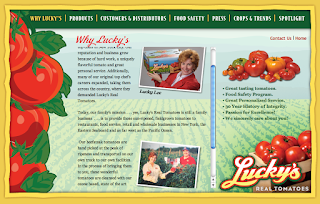 • Lucky’s Tomatoes are family owned. • Other may be family owned, but lots are not. They are treated like a commodity and traded. • Lucky’s Tomatoes cost a bit more, well they cost a lot more. But we feel they are well worth it. Lucky’s Tomatoes are based on what it cost to pay people a fair wage. • Other brands are based on what the market bears and how much the brokers can make. • Aroma Thyme is dedicated to serving Lucky’s Tomatoes, unless we can get local or grow our own. • Most restaurants would not dream of spending the amount of money a real tomato would cost, such as a Lucky’s.